Dock n’ Go Service: When you simply want to tie up and leave, just let us know and we’ll arrange to have one of our capable deck hands wash down your boat and prepare it for your next visit! 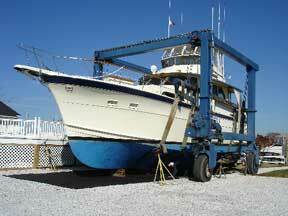 Boat Hauling and Power Washing: We will schedule a time convenient for you. Our 50 ton travel lift can accommodate even the largest of boats. Engine and Systems Mechanical: Complete diesel and gas engine repair, refit, and repower. Bottom painting and other general maintenance services: Please let us know your specific needs we will be happy to work with you. Winter Storage: Our property can accommodate all our slip holders and then some. Help us plan your time out of the water to ensure you start your year without any delay. Our amenities include a fuel dock, well-maintained swimming pool and an upscale lounge. A beautiful large elevated deck surrounds the pool, offering great vistas of the harbor, cool breezes, and a central location for our many activities and social functions. This website is powered by Marinas.com - the best place to find marinas online.